I've previously written about the regularity of community theater performers and how entertaining it is to see familiar faces in new venues. It's far easier for me to recognize local actors than Broadway ones, despite the latter's fame; I don't know about you, but I have neither the time nor budget to patronize Broadway performers with any frequency. But there are professional theaters nationwide that offer quality productions and actors, and I've been glad to be able to partake of several shows starring one dynamic duo. 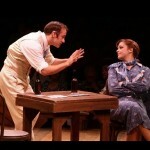 Emily Afton) as Bobby Childs and Polly Baker" title="Crazy For You #1" width="150" height="150" class="size-thumbnail wp-image-491" align="right" />Crazy For You is a 1992 update of the 1930 Gershwin musical Girl Crazy. In the desert town of Dead Rock, Polly Baker is the proprietor of a has-been theater that's about to be repossessed by the bank. Bobby Childs is the New York bank owner's henpecked son, sent to Dead Rock to close the deal. When Bobby's background comes between his and Polly's budding romance, can his devious plan win back both the theater and the girl? 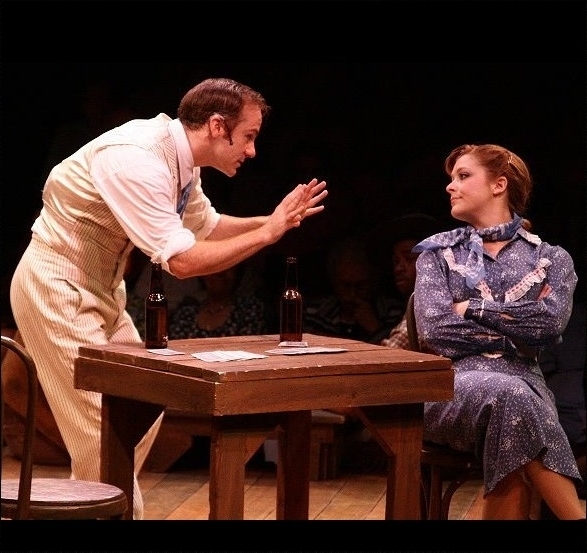 It's a lighthearted and funny story that the Mac-Haydn Theatre of upstate New York has smartly headlined with Colin Pritchard and Emily Thompson as Bobby and Polly. 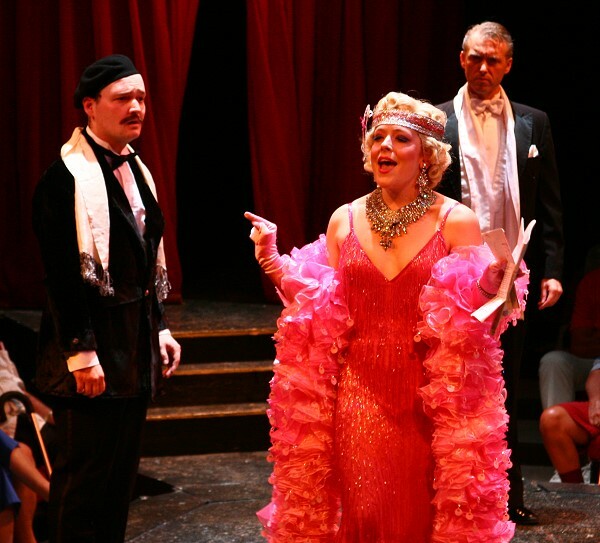 These two alumni of the theater's 2007 season, where they played Singin' in the Rain's Cosmo Brown and Lina Lamont, have been reunited for this one show. Each brings a natural enthusiasm for the stage and each other. Mr. Pritchard is as ebullient as ever, sweating as he performs his usual madcap antics involving a variety of props, costumes, and spontaneous dances. Ms. Thompson has a magnificent voice that, after being submerged in her previous performance as Lina Lamont, is finally unleashed to marvelous effect. With each star complementing the other's strengths, they are so obviously happy together. 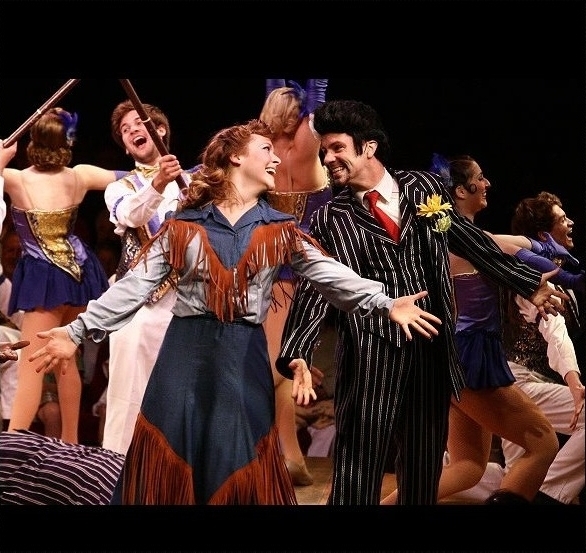 Crazy For You is clever enough to give the rest of the performers their moments in the spotlight, resulting in a well-rounded cast of characters. Joe Bettles' Lank Hawkins is an excellent foil for his more quick-witted company, resulting in some memorable one-liners. Ben Jacoby is the eccentric diva of a director who is humbled when he realizes his infatuation for Tess (Tara Tagliaferro) has become a potential love lost. And assistant director Karla Shook doubles as the irate Irene Roth, a shrew of a fiancee who is not so manipulative as to be unlikeable. But the scenes that have the audience holding its breath are the ones that employ the entire company. When you first see the Mac-Haydn's performance space, you might think it a constraint for being so small — but director and choreographer Tralen Doler sees it as an opportunity. Every cowboy and showgirl that can squeeze into Dead Rock collaborates for show-stopping numbers, especially at the end of each act. Environmental props, from lassos to pickaxes, are expertly handled to maneuver the stage and the dancers into unique configurations and routines. All the numbers, be they group or solo, are sung with the right amount of joy, as in "I Got Rhythm" and "Slap That Bass", or longing, as in "Embraceable You" and "Someone to Watch Over Me". A note about the Mac-Haydn: the audience is seated around three-quarters of the round stage, and though the actors do their best to play to each audience member, the most consistent view is found in the seats along the aisle between sections 3 and 4. Filed under On Stage; Comments Off on THAT'S the Broadway Melody! 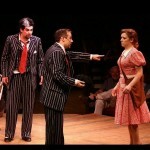 As an actor myself, I often view theater productions from a thespian's perspective. 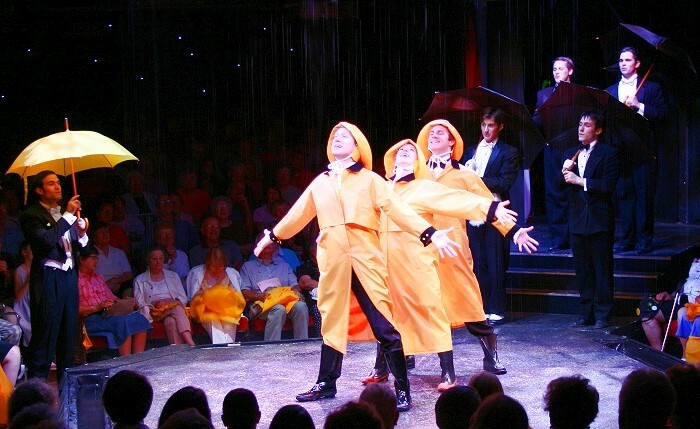 But this weekend, I was in the audience of a production of Singin' in the Rain that was so bedazzling, so creative, and just so fun that I was left with nothing to do but unabashedly enjoy myself. 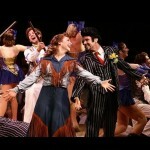 The Mac-Haydn Theatre of Chatham, NY, performs summer stock shows in theater-in-the-round format. The stage is octagonal, with the north side featuring stairs ascending to backstage, and aisles for audience and cast use to the east, west, and south. I was seated in the front row in a seat along the south aisle, giving me a direct view of this classic story of lucky star-crossed lovers at a studio about to break into talkies. Though I had a perfect sightline, I can't imagine there were any bad seats of a stage so effectively used. 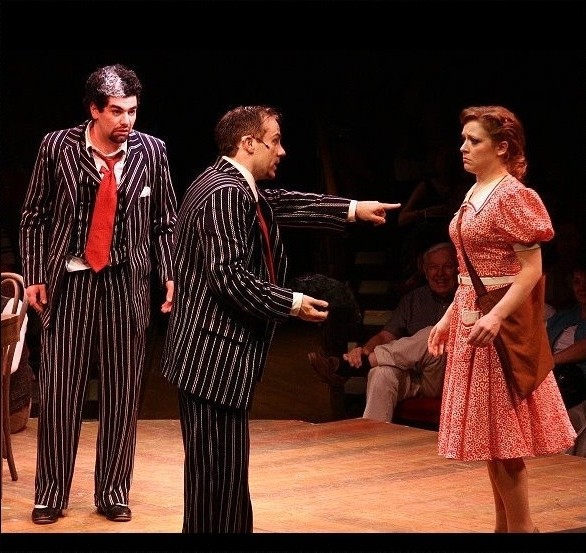 Theater-in-the-round is often considered a challenging (and limiting) atmosphere, but the cast took full advantage of the opportunity to play to all sides. Rather than parade across a standard stage like a boring stock ticker, the performers moved laterally and vertically, working with sets that played off these possibilities, and circling each other in impressive dance numbers. 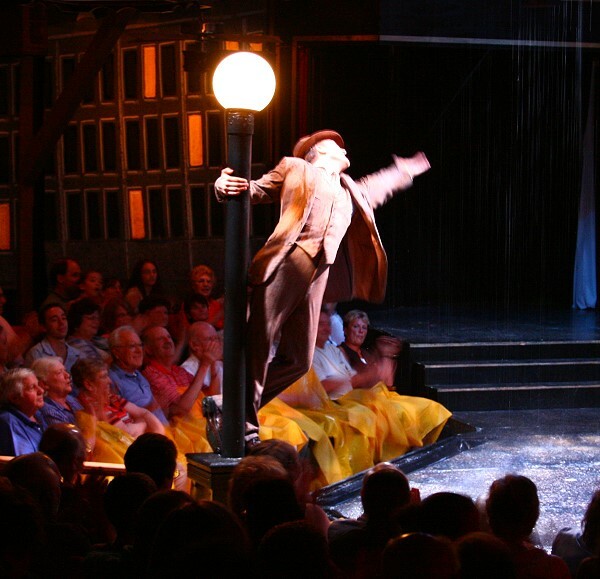 The most astounding interplay of dance and stage was the first act closing with the iconic dance in the rain, which I cannot imagine having been possible in any other theater configuration. In the scene's preceding blackout, the stage's perimeter opened to reveal gutters, and an ominous peal of thunder cued the front row theatergoers to don their supplied raincoats. Before we knew it, a full-fledged rain storm was in effect, with the gutters doubling as puddles for Lockwood to gleefully splash through. He sang, danced, hopped, and swung from the lamppost which to see live was more memorable than anything Gene Kelly had ever impressed upon me. Though Don Lockwood and Kathy Selden were the stars, Cosmo Brown and Lina Lamont were their equals in enthusiastic performances. Colin Pritchard played Cosmo with a certain manic quality necessary to tolerate the studio shenanigans his character must endure. In most any scene between him and Andrew Chartier as Lockwood, Cosmo came across as the driving force, providing a crazed energy that unfortunately did not match the choreography in his big scene, "Make 'Em Laugh". Though Donald O'Connor's aerobics would not lend themselves to the live stage, the substitutes Pritchard was given fell flat, such as a nose-biting rubber chicken, a valkyrie's helmet and wig, and other props. But he played these scenes with the same athleticism he lent more satisfying tap numbers, such as the comical "Moses", making for an overall excellent performance. Emily Thompson (now Emily Afton) as Lina Lamont portrayed the dim-witted shrew with gusto and glee. Her shrill voice, flat attempts at sophistication, and utter unawareness made for a completely unsympathetic yet entirely enjoyable villainess. My only lament for Lamont, played by a former Ado Annie, is that she went through this fantastic production in its only non-singing role. But she used her several scenes to play off others, deliver victim-mentality soliloquies, and take a great big custard pie in the face — in Cosmo's own words, a formula for success. Thompson, Kelly Shook as Kathy Selden, and the rest of the female cast showcased stunning costumes that did not steal the scenes but instead accentuated the performers, whether they were delicious candy cuties or elaborate Elizabethan ladies. The men complemented their counterparts with smart sweater vests and trim tuxedos. Most of the film's classic tunes were present, from the Romeo-and-Juliet setting of "You Were Meant For Me" to the red-eyed "Good Morning". "All I Do Is Dream Of You" appeared to have been replaced with "You Stepped Out of a Dream". In all, the soloists were smooth and the ensemble blended well. The one and only time I saw the movie Singin' in the Rain a decade ago prompted me to buy the soundtrack CD, but the story itself left me wondering how the film had garnered such accolades. Perhaps I needed the past ten years to expand my musical vocabulary and create a context for these experiences, as the performance Mac-Haydn gave me this weekend was phenomenal.